The Cumberland & Dumfriesshire Farmers Mart P.L.C. had forward 36 prime cattle, 24 over thirty month cattle, 3,778 prime lambs and 4,942 cast ewes & rams at their weekly sale at Longtown on Thursday 29th July, 2010. Clean cattle were short of quality sorts. Limousin bullocks to 159.5p Dashwellgreen. Angus heifers to 157.5p (x2) Townfoot. OTM cattle met a brisk trade for a plainer show of cows. Top of 127.5p for a Black & White heifer from Mrs J. James, Low Todholes, others 106.5p Glencartholm; Limousin 125.5p F.J. & L.M. Tinning & Sons, Mossband House. Limousin cows to 107.5p Smallholms, 96.5p, 93.5p Becks, 91.5p Greystoke Castle, 89.5p Becks; Friesian 87.5p Jerriestown, 77.5p Glencartholm; Blonde d’Aquitaine 85.5p Becks; British Blue 82.5p Gillalees; Charolais 79.5p, 72.5p Gillalees. The 3,778 prime lambs sold to the usual full ring of buyers. 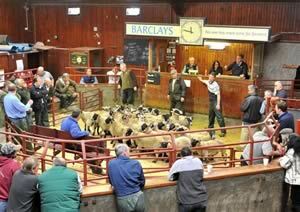 Trade for all classes met recent high rates with buyers keenly seeking sheep, leading to a scale average of 168.5p per kilo. Top price of 212p per kilo for Beltex from Messrs W. Gribbon & Co., Waterside, with a top per head of £90.50 for Texels from G. Brough, Old Rectory, others £87.50 Barnglies and Ormiston; Beltex £86.80 Waterside, £84.50 Hermitage, £83.80 Old Rectory; Suffolk £86.50 Cardew Hall, £85.50 Barnglies, £81.20 Roughet Hill; Charollais £82.50 Pates Hill, £79.50 High Floweryhirst, £79.20 Kirkend; Half Bred £74.80 Adderston Shiels, £67.80 High Moat; Zwartbles £74.50 Westhills; North Country Cheviot £73.80, £71.80 Adderston Shiels; Greyface £69.50 Rimington Way, £60 Rosgill Hall; Leicester £66.20 Westend; Bleu d’Maine £64.80 Henrys Hill; Cheviot Mule £64.20 Sundhope; Oxford £64.20, £61.80 Guards; Hampshire £63.80 Croft House. The 680 light weight lambs sold to a top of £63.80 for Beltex from Oaktree Drive and Texel from Yules Croft, £60 Murtholm; Suffolk £61.20 Firth Farm, £60 Murtholm, £56.80 Whitehill Cottage; Charollais £60.20 High Dovecote; North Country Cheviot £58.80 Effgill; Greyface £55.50 Haggistone Holm, £51.80 Nettling Flatt; Blackface £55.50 Penpeugh; Romney Marsh £54.80 Jury Park; Wensleydale £54.50 Effgill; Ryeland £50.80 Jury Park. Another cracking show of 4,942 cast ewes and rams was forward to a larger ring of buyers, resulting in a tremendous trade for all classes. Good meated ewes were readily wanted, seeing them around £8 to £10 per head dearer on the week. Hill ewes also met a good trade seeing them around £5 to £7 dearer on the week. Heavy ewes sold to £138.50 for Texels from Kingfisher Farm, others £132.50 Roadside; Suffolk £136.50 Lydden Court, £126.50 Moyadam Park and The Challenge; Leicester £128.50 Midtodhills, £113.50 Stackbraes, £110.50 Westend; Bleu d’Maine £122.50 Kirkton; Charollais £120.50, £102.50 Severs, £102.50 Church Farm; Beltex £108.50 Derwent; Cheviot Mule £102.50, £93.50 Torwoodlea Mains; Half Bred £96.50 Alton Farm; North Country Cheviot £94.50 Earlside, £93.50 Roadside, £90.50 Gospel Hall; Greyface £93.50 Howden, £90.50 Colte Coates, £88.50 Butterdales; Zwartbles £80.50 Holmlea; Oxford £80.50 Whinfield; Dorset £80.50 Porteath. Hill ewes to £80.50 for Cheviots from Stackbraes; £68.50 Pennine View; Lleyn £78.50 Plumpe, £70.50 Derwent; Beulah £76.50 Golden Lane; Blackface £75.50 Albierigg, £72.50 Deuchrie, £68.50 Old Police House; Swaledale £74.50 Butterdales, £72.50 Stubsgill, £65.50 East Unthank; Herdwick £71.50 Stackbraes; Jacob £52.50 Millcourt. Rams to £138.50 for Suffolk from Doorpool, £123.50 Torwoodlea Mains; Texel £130.50 Willimoteswick, £128 Townfoot; Leicester £128.50 Linton House, £112.50 Sundhope & Albierigg; Bleu d’Maine £123.50 Moyadam, £83.50 Henrys Hill; Blackface £98.50 East Farm, £68.50 Caberston; Beulah £92.50 Golden Lane; Dorset £88.50 Porteath, £78.50 Golden Lane; Zwartbles £86.50 Holmlea and Winterhope; Hill Cheviot £86.50 Cooms, £76.50 Sundhope; Easycare £56.50 Dowlaw. Goats to £55.50 Red House.